Today is Election Day here in the United States! Here's a round up of a few things I've read and a few things I've written about voting. "You're Disillusioned. That's Fine. Vote, Anyway." Some really great advice from Roxane Gay. "What if the Polls Are Wrong Again? 4 Scenarios for What Might Happen in the Elections." Some interesting analysis from NPR. Not a bad way to practice Stoic preparedness for some of the possible outcomes. "A Guide to Voting for UTC Students." A guide for students at the University of Tennessee at Chattanooga that might also be inspiring or useful for students elsewhere. "Voting is Like Going to the Dentist." My recent attempt at a metaphor for voting: "Voting is like going to the dentist. You don’t have to like it. You don’t have to look forward to it. But every so often you should probably do it." "Uses of Philosophy, Part 3: Intellectual Empathy -- Understanding Without Agreeing." My defense of one of the benefits of philosophy and how it might apply to our current political culture. "Dreaming, Principles, and Cooperation: Science Fiction, Philosophy, and Politics (Part One)." 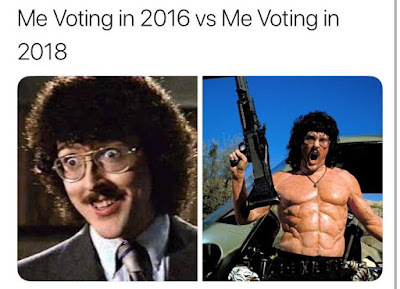 It's a bit melancholy going back to stuff I wrote before the 2016 election (see the above Weird Al meme for context), but this one gets at a bit of how I approach politics overall. "American Voters and the Fate of Us All: Eight Reasons to Vote with Objections and Replies." 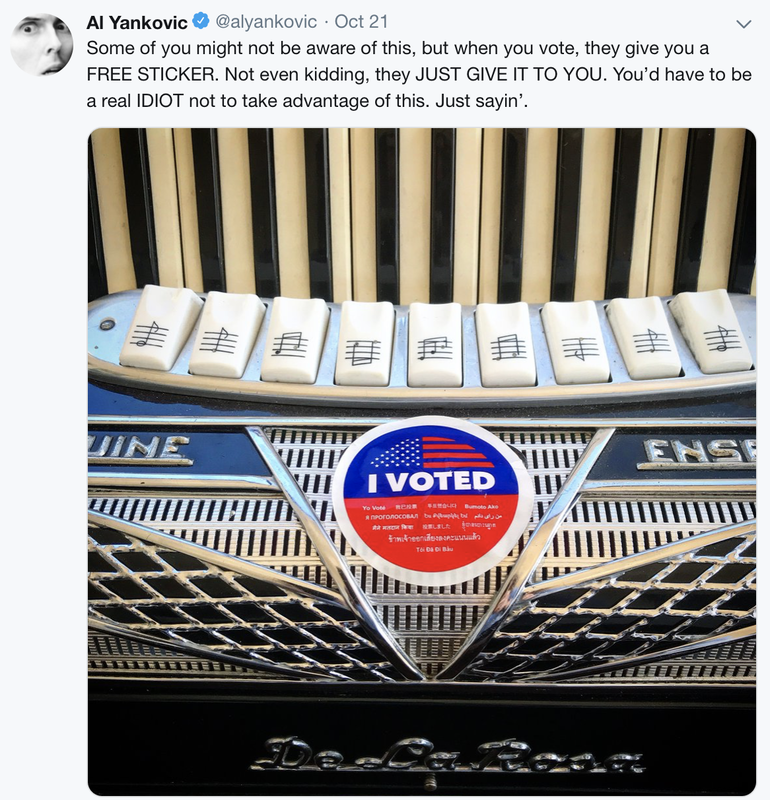 Another melancholy throwback to 2016, but I still stand behind the reasons and responses to common objections that I gave here (especially the bit about cool stickers). And now my fellow Americans, I ask you to stop reading this, and please, for the love of whatever you hold dear: vote! 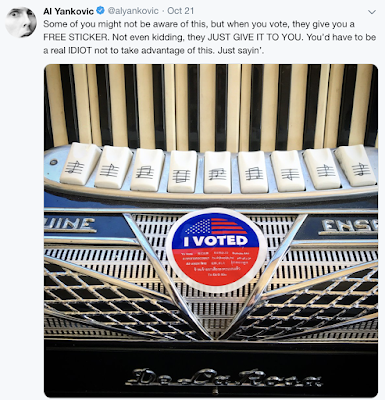 Bonus tweet from Weird Al! EDIT (10 Nov. 18): I'll have a post on my thoughts on the results of the election later, but I just realized this is the 300th post on this blog! Congrats to me!